POLARIS WORLD “AS SEEN ON TV “ LIVE THE DREAM !! 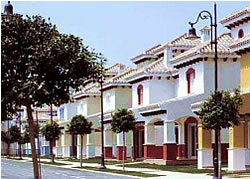 Polaris was set up in 2001 by Pedro Garcia, with the backing of various other investors. Polaris World now owns over 20 million square metres of land in the region of Murcia, where they are currently developing a variety of “World Class” Luxury Resorts. Each one comprises individual landscaping, unique developments with high quality security systems and built around Golf courses designed by Jack Nicklaus & & Dave Thomas. All the resorts are located within a short drive from the area’s famous beaches of the Mar Menor and the beautiful city of Murcia . Only 15 Minutes drive from San Javier Airport and 40 minutes from Alicante. With the policy of keeping all stages of development, construction, marketing and service in-house, Polaris World has bought together a group of prestigious international partners comprising of names such as EDSA plan ( USA ) Alemn Architects, Dave Thomas & Nicklause Design, Porcelanosa, Hunt Hamilton Zuch of Chelsea, London and the Intercontinental Group, amongst many. Quality – Security – Superb Services - Environmentally friendly urban planning – Meticulous design – 2 metre high security fence around the resorts – Full bank guarantee on all client payments – 24 hour security – All properties are centrally heated and fully air-conditioned. All the resorts are uniquely different and no two streets are the same. All the homes boast uninterrupted views and privacy. The internal designs of the properties have been very carefully thought out and all retain the authentic Spanish feel with traditional wooden beams and Spanish style roof tiles. Restaurants, Bars, pubs, Shopping Centres, Sports Shops, Delicatessen, Kindergarten/Nursery, Health Spas, Gymnasiums, Golf Courses, Golf Schools, Pitch and Putt, Swimming Pools, Numerous Parks and Green Areas, Tennis Courts with coaching available, Horse Riding, Football Pitches and Coaching, Rental Management, Laundry and Housekeeping, Gardening Services, Catering Services, Car Hire, Travel Agencies, Shuttle Service between Resorts and Aid Facilities.